Can It Help Me Gain Control of My Health? I have two favorite definitions of Iridology. 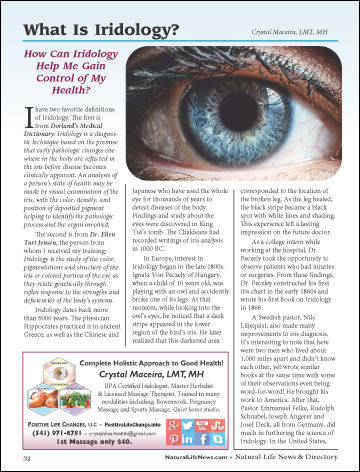 The first is from Dorland’s Medical Dictionary: Iridology is a diagnostic technique based on the premise that early pathologic changes elsewhere in the body are reflected in the iris before disease becomes clinically apparent. An analysis of a person’s state of health may be made by visual examination of the iris, with the color, density, and position of deposited pigment helping to identify the pathologic process and the organ involved. The second is from Dr. Ellen Tart Jensen, the person from whom I received my training: Iridology is the study of the color, pigmentations and structure of the iris or colored portion of the eye as they relate genetically through reflex response to the strengths and deficiencies of the body’s systems.